The iced coffee packaging we designed last year for One Tree Coffee Co was featured a few days back on Lovely Package. Since then the vintage-styled branding has spread like wildfire: it's been blogged, reblogged, tagged, reviewed, liked, saved, commented on, ffffound, hearted, tweeted and tumblr'd. We're also due to appear this week in the UK Lifestyle News Network. 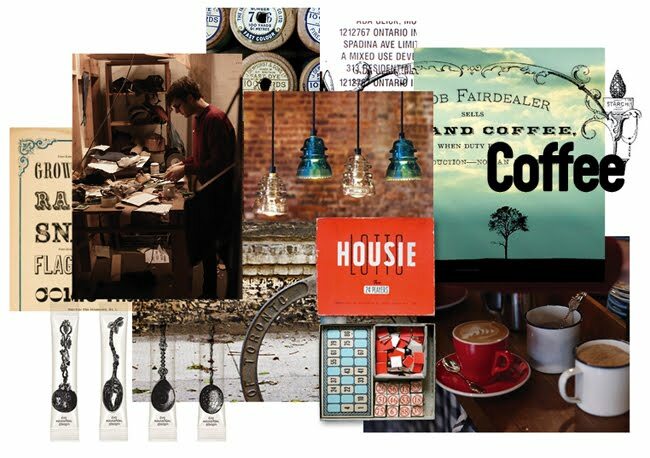 Since everyone has shown a little interest I thought I'd share for your viewing pleasure the mood board we built when first establishing the colour palette, styling and general feel for the espresso bar. The completed design work can be seen in our portfolio online.